Do you have a soulmate? Or a very, very close friend to whom you can bare your heart out to, talk to about all your darkest and dirtiest secret, tell about the most embarrassing things regarding yourself? Someone who knows exactly how you feel even when you often find yourself unable to adequately express your emotions. Someone who’s at the same frequency, someone who truly understands? If you do have someone like that, I envy you. 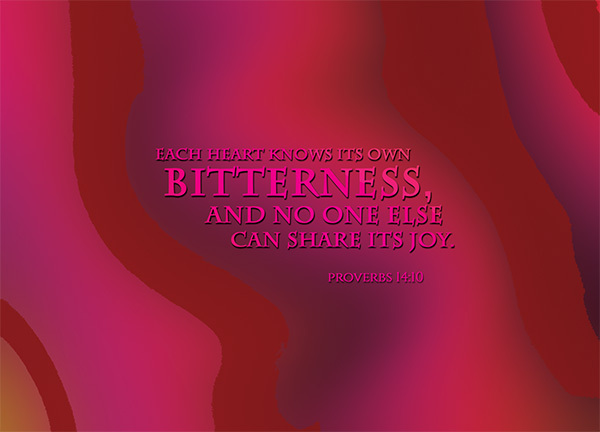 The book of Proverbs is a book of wisdom, and in it we find verses and verses of wise sayings. How many fellow believers can you speak with openly regarding your deepest hurts, fears, failures and thoughts? People – Christians – whom you trust enough (because they have proven themselves trustworthy) and whom you know will not trample your feelings, your fears, your hurts and your thoughts under their foot and turn around and maul you for them [Mt 7:6]. Maybe that person doesn’t always understand, maybe that person often fail to understand, but he or she is able and willing to listen to you voice your grievances, willing and able to accompany you and offer a listening ear without judging you for whatever you share with them. Maybe they won’t be able to help you, but at least they won’t judge you, and they will truly and genuinely rejoice with you in your victories and walk with you in your weaknesses, then that is enough – you are very blessed. In this study we are going to examine what this verse suggests – that nobody will truly understand you, whether in bitterness or in joy. First off, do you agree with Proverbs 14:10? It sounds gloomy and pessimistic, and I’m sure many people will insist on disagreeing that this verse is absolute and argue that there are people who could truly understand us. People who can truly share in our joy and truly know our bitterness. I think it hard to be that hopeful, but I cannot deny that I’ve always been seeking a someone like that. Whether you agree or disagree – you may disagree because you have already found someone who you feel truly understand you; or you may disagree because you are seeking a someone like that and do not one to be told that your search is meaningless. Whether you agree or disagree, it doesn’t matter. That’s not the point of this verse. We’ll find out why. Each heart knows its own bitterness – Again, do you agree with this statement? Do you really know your own bitterness? In general we would say yes, wouldn’t we? We would know the extent of pain that we’re feeling. When we’re shrouded in despair and in misery, while we may not know how to express it, but we certainly do feel it – the full impact of it. And perhaps if we have been through it before, we would claim to understand when somebody else is going through the same thing. We would claim to understand the extent of their bitterness and their pain. But do we truly? Jeremiah might have been one of the most expressive prophets ever, fondly known as the Weeping Prophet even today. This was what he said regarding the human heart – the heart is deceitful above all things and beyond cure. Who can understand it? [Jer 17:9|Article] Do we ourselves even really understand our own hearts? Or are we being deceived by our own hearts? Perhaps you would argue that someone who has been through your suffering before will know exactly how you feel. For example, somebody who has been fired before will know how it feels to be fired. Somebody who has lost a child before will know how it feels to lose a child. And while I totally agree with that, I think that’s where it ends – they may know how it feels, but they won’t know exactly how you feel. Different people react and respond differently to things. And circumstances, no matter how similar, always differ a little on the details. And it will boil down to these little differences that will cause you to feel as if the other person doesn’t truly or fully understand your grief. That said, though, most of the time it is enough just to have someone who knows how it feels. They may not fully understand how you feel, but you can already gain great comfort from knowing that they know how it feels. and no one else can share its joy – sharing in misery is easy. It’s not difficult for people to share in your grief – a stranger whom you’ve never interacted in your life before may sympathise easily in your circumstances, but he or she will not be happy for you if you’re happy. It takes a genuine friend to be happy for you when good things happen to you – especially if that friend is not in the best of circumstances, or more so if your joy is built on his or her misfortune. For example, perhaps you and your friend are colleagues, and you got promoted when the rumour touted him as the most likely candidate. If you are able to share his grief, and he is able to share your joy, and the two of you are able to balance that out to some kind of result, now, that’s a genuinely close friend. Most people can’t, though, not because they are lesser characters – but simply because it requires both to know each others joy and bitterness. That’s rare. For a very long period of time I desired for a soul mate very deeply – very desperately, if I can confess. I never could find one, and I comforted myself by the knowledge that while nobody knows my heart’s bitterness, God knows. While nobody can share my joy, God can. And while I may one day find that soul mate of mine (and I seriously don’t mean finding a life partner), I know fully well that I need to temper my expectations – for this soul mate may not fully understand my heart as God does. How do I know God does? Here’s where logic falls apart and you get the choice to take me seriously or not – I simply do. Not because the Bible tells me so – it does say so, in Psalm 139 among others. Not because I feel it, although sometimes the sudden bout of peace that is equally illogical hits me during a period of misery and suffering and I can only credit it to God. Not because God sits opposite me physically as I bare my heart out to him over a weepy coffee session like a regular soul mate would, though I’m convinced of the fact that God is omnipresent, and has heard all my rants and feelings, even if I wasn’t praying. No, there’s no logic in this. I simply believe that God knows. And because God knows, it’s okay not to have a soul mate. Because God knows, it’s okay if nobody truly understands the full extent of my feelings. Because God knows, it’s okay even if I don’t really know my own heart. Because God knows, and God is here. That’s enough, more than enough for me.